Another impressive palm that adds a touch of elegance to our tropical paradise. We love that it is not only strikingly attractive, but relatively small and slow-growing, just perfect to be grown in containers to suit our small garden which is mostly paved. Furthermore, Rhapis excelsa is included in the list of air-cleaning or air-purifying plants, which was the impetus for its addition to our garden in 2003. Common Name: Lady Palm, Broadleaf Lady Palm, Bamboo Palm. Plant type: An ornamental palm tree, native to Southern China and Taiwan, was introduced to Japan from China in the 17th century, though now popularly grown worldwide. Light: Adaptable to a wide range of light, from shade to full sun. For best leaf color and optimum growth, grow it in bright, indirect sunlight though it can handle low light conditions. Leaves tend to be darker green in the shade, but change to lighter green or yellowish green in direct sun with a tendency towards tip-burn until acclimated. Moisture: Moderate water regularly. Loves moist well-drained soil, so water thoroughly through each time, but avoid waterlogging that can cause root rot. Can be moderately drought-tolerant for short periods, once established. Tolerant to both humid and dry climates. Soil: Grows in a wide variety of well-drained soil – can be clayey, loamy or sandy, and mildly acidic. Propagation: Propagated by seed or division of clumps (canes) that readily produce offshoots from underground rhizome, the latter being the easier method of propagation. Best time to divide the clumps with a machete or similar tool is when they are overspread on ground or overly pot-bound, or when the tough root system has cracked the terracotta pot as seen in this image. They are very hardy survivors and can withstand the stress of division. (Incidentally, our Veitchia merrillii (Christmas Palm) is another pot-breaker!). Features: Rhapis excelsa or Lady Palm is an elegant and evergreen fan palm that is popularly grown in the tropics, as well as subtropical and warmer temperate regions. A fairly small and slow-growing palm, inching upwards about 8-12 inches yearly (much slower if grown indoors) to a maximum height of about 10-14 feet (3-4 m) and a spread of less than 3 feet (1m). It self-propagates via underground rhizome, forming multi-stemmed clumps that can reach enormous width, spreading as wide as its height or more. 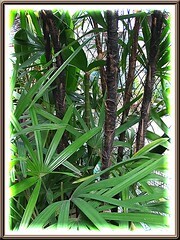 Each slender and upright stem or cane is covered with a coarse matted brown-black fairly-loose fibrous material which is actually the outer base of the leaf sheaths. When these sheaths eventually fall or are pealed, leaf scar patterns are revealed, resembling bamboo canes, giving R. excelsa its other common name ‘Bamboo Palm’. Shiny deep green foliage are borne along the stems, with new frond emerging from the top center of stem. They are held on slender petioles, 0.75-2 feet (22-60cm) long, that are covered with greyish hair. 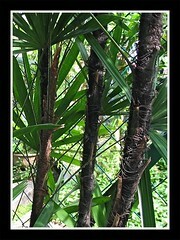 Each palmate leaf is large and broad, reaching 2 feet (60 cm) across, hence the other common name ‘Broadleaf Lady Palm’. It is divided into broad strap-like, ribbed segments, ranging from 5-13 segments, with saw-toothed tips and fanned out in a semicircle. This dioecious palm also produces spectacular pinkish inflorescence at the top of the stem. Flowers are yellow and ripened fruits are rounded, fleshy and white. Care: Rhapis excelsa grows easily with least care as it is very adaptable to a wide range of climate, soil and environment. Hence, it is the most popular and widely grown of the Rhapis species. For best results, grow in well-drained soil with organic matter, water thoroughly and regularly, locate in semi-shaded area with dappled sunlight, and provide minimal fertilizing. Also, cut away dried or discolored leaves and thin out plants and leaves if necessary, to keep it tidy and improve ventilation. It is advisable to keep the plants healthy by showering them with a water hose (or bring out into the rain potted indoor plants) occasionally to remove dust and dirt. Least bothered by serious diseases and pests. The usual pests if any, are the scales, mites and caterpillars and the occasional diseases are root rot due to poor drainage and black fungal spot on leaves due to poor cultural practices. 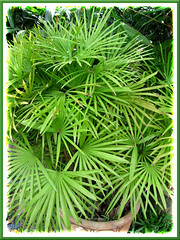 Learn more about Lady Palm’s proper culture, care and remedies at Palm & Cycad Societies of Australia and Plant-care.com. 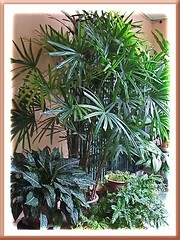 Usage: R. excelsa is extremely versatile and well-suited, whether outdoors or indoors. 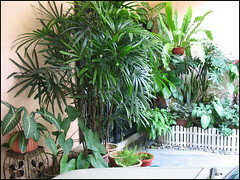 Outdoors, it is excellent for landscaping, gardens, parks, borders, or mass-planting to create hedges or dense screens. Widely used as ornamental palm in containers or above ground planters/tubs along sidewalks, road dividers, and at commercial areas such as hotel and shopping mall entrances. Great too as an accent or specimen at courtyard, porch, or patio. 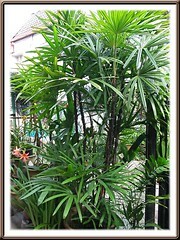 Indoors, Lady Palm is popularly used as a decor plant in homes, offices, hotel lobbies and shopping malls. Its easy culture and maintenance, small and elegant display, slow-growing habit, low light and humidity requirements, as well as its capability to improve quality of indoor air, all these make it most ideal as an indoor or house plant that is well sought after. Their strong and hardy bamboo-like canes are excellent for staking plants and vines that need support. 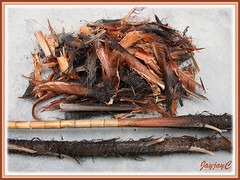 Hence, when thinning large clumps of Lady Palm, do not discard the unwanted stems, recycle them instead! For sub-tropical & temperate regions: Cold hardiness: USDA Zone 9-11. R. excelsa is quite cold hardy, tolerating temperatures as low as -5 degrees C and can be grown outdoors in subtropical or warm temperate climates. Check info at Floridata. Other information: There are many miniature and dwarf forms of Rhapis excelsa, known collectively as Kannonchiku, which include the green and variegated varieties that are considered collector’s items. These have been cultivated in Japan from as early as 1600 AD. Read further about it at PACSOA and be astounded with some of the many exquisite varieties at Rhapis Gardens. Here’s another interesting Rhapis Palms article that includes culture tips too, from Rhapis Gardens for further insights. Learn how-to propagate Rhapis excelsa (Lady Palm). 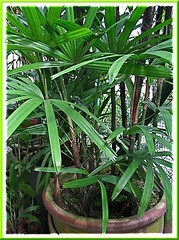 Please inform how to measure the height of Raphis Excelsa, is it from the surface of soil or include the polybag (pot) height? Measure its height from the soil’s surface, Nana! what are various varities in rhapis,how to differentiate between them . Sorry, no idea, aashu! Check at Rhapis Gardens’ link shared above or google-search yourself for answers. Hi there that’s a lovely palm, would it grow in Melbourne Australia? If not, do you have any ideas re plants that are under 5 meters high and under 3 meters wide? I ask because we have a north facing area that’s sheltered from the wind and we want a tropical look with a canopy and understory. According to some source, Rhapis excelsa is cold hardy to regions similar to USDA Zones 9-11. An alternative tropical palm that fits your description could be the Vanuatu Fan Palm – read about its features at https://www.jaycjayc.com/licuala-grandis-vanuatu-fanpalm/.